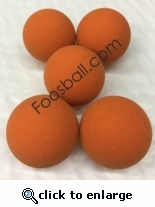 The Shelti Orange ball is a bit harder/slicker/faster than the Standard Yellow Shelti ball. Good for more rollerball style of play. Quantity is for one ball.